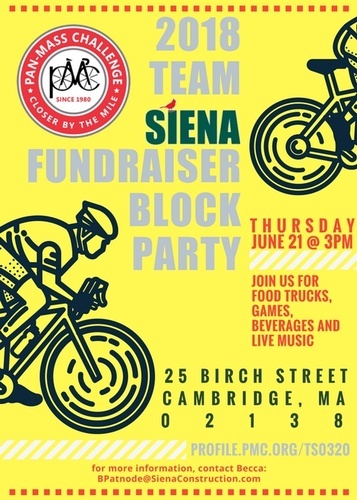 Siena Construction: Fundraiser Block Party! We’re putting the FUN in Fundraising with an awesome event at Siena’s headquarters, 25 Birch Street, Cambridge, MA. 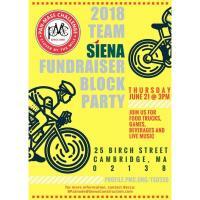 Join us for a late afternoon of socializing in support of the PMC and Siena’s Team. There’ll be games, music, food, cocktails, and auction with great prizes donated by some of Boston’s best hotspots and attractions. Meet the team and the Cardinal family! On August 4th and 5th, for our second year, Siena will join more than 6,000 other cyclists in the 39th Pan-Mass Challenge, a bike-a-thon that raises money for cancer research at the Dana-Farber Cancer Institute in Boston. This spectacular event raised $51 million last year by donating 100% of all rider raised funds to the Dana-Farber Cancer Institute.